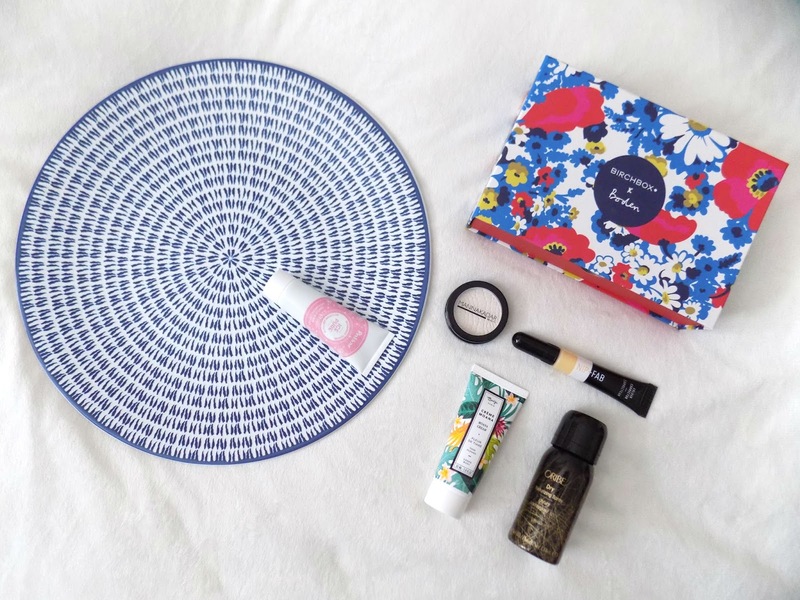 Now I absolutely love this months Birchbox, isn't it just STUNNING. It's so pretty and I am definitely going to be keeping this on my dressing table as I love it so much. 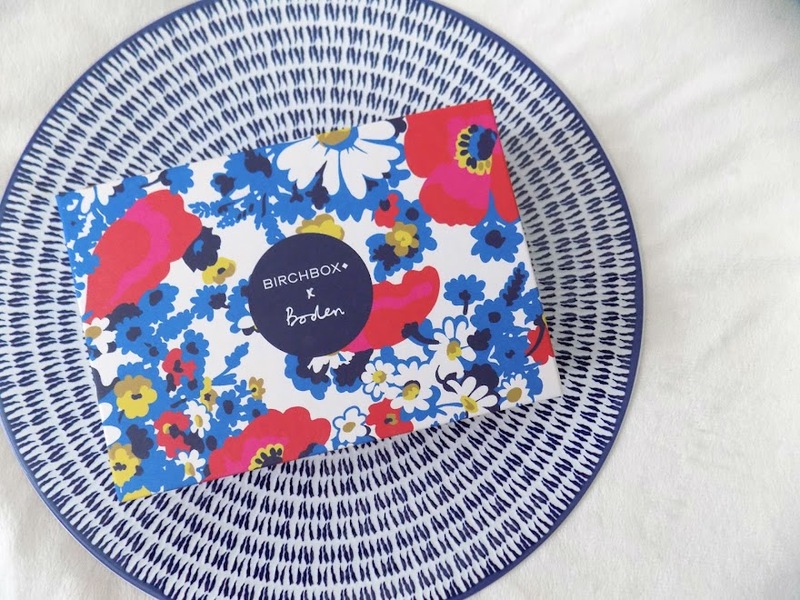 Anyway, this months Birchbox was a collaboration with Boden and the theme was The Bold & The Beautiful which they certainly fulfilled with this amazing box. I can't stop looking at it. But what's inside is very exciting too as there are two, yes two full size makeup products which is awesome as well. 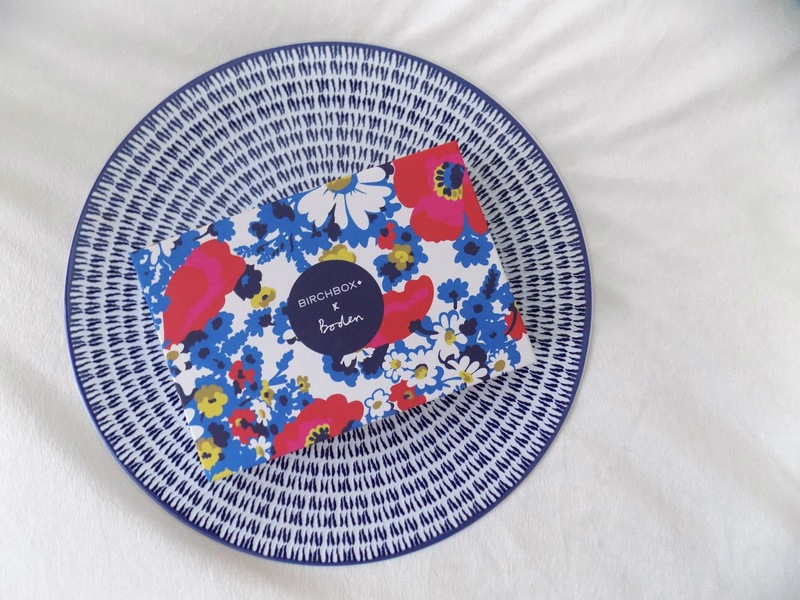 So first is the MANNA KADAR COSMETICS High Definition Powder £27 and this is the first full size product which is a Birchbox Exclusive, and it's very exciting and always nice to see something unique in the box. Birchboxers got to choose between this powder, or the Radiance Split Pan Bronzer and Highlighter Duo but I obviously picked the powder and I feel I would get more use out of it as I find with the bronzer products I receive they're either too dark or too orange for my fair skin. But the powder feels amazing, I love that it's small so it's great for a makeup bag or if you have limited space say if you're travelling or something. Next is the second full size makeup product in the box and it's from the brand new Nip + Fab makeup line which I've already done a post on what I picked up and my thoughts, and luckily this guy wasn't one of them so I'm keen to try it out. I guess I should tell you what it is right? It's the NIP + FAB Colour Correcting Concealer, they're an affordable brand so it's only £8.95 and I got the Banana shade which as you would think is a yellow concealer that corrects and acts like a subtle highlighter to illuminate the skin. They also have the Orange which brightens dark circles, Green that neutralises redness, and Purple that corrects dull, sallow skin. Then we have the most exciting product in the box which I freaked out over. The ORIBE Dry Texturizing Spray which is a pretty pricey hair product at £20 for a travel size which is slightly bigger than this one I think, and £40 for the full size, which this obviously is not. This is a cult classic. It's pricey but it's a nice hair product that smells incredible, and although I like it, is it worth the price? You'll have to wait and find out in an upcoming post on this product. Polaar is a brand I have received before and all the products I've really enjoyed. So when I saw the POLAAR IcePure Gentle Scrub with Arctic Cotton, I was looking forward to trying it. This is £23.50 for the full size which is pretty high up there for an exfoliator. I am very picky with my scrubs, I don't like them to be too harsh and damage my skin as I have quite sensitive skin so I'm hoping this will be gentle enough, if not I can use it on my body or feet or something. I've never heard of Arctic Cotton but the little info booklet says it's a powerhouse ingredient known for it's moisturising properties. So we shall see how this performs. Finally is the BAÏJA PARIS Créme Moana in Fleur De Tiaré which is a luxurious body cream, and although it feels nice on the skin and a little goes a long way (they do warn you of this in the little info booklet) I am not a fan of the scent so I will see if my Mum likes it and give it to her. It feels lovely and it's got amazing ingredients in but I just don't like the scent and couldn't stand to have it all over my body or where I would be able to smell it a lot. First is a co-washing product from ELGON which is the Deliwash Cleansing Conditioner and basically this combines the cleansing action of a shampoo and the hydration of a conditioner into one bottle for a quick, one-stop-shop. It's sulphate-free and it says it's great for all hair types although I am a little anxious as I don't like my shampoos to be too harsh that it dries out my hair, but also that my conditioners aren't too nourishing as it weighs down my hair. I shall give this a try but too be honest, these 2-in-1 products never really work for me. Next is the MODEL CO Contour Stick that I initially mistook for a lipstick, I was very shocked and turned off by the shade as a lipstick, but even as a contour, it still wouldn't work for me. It feels nice, and when applied onto my hand to try it out it blended well, the shade is just a no no, but if there are other shades, I would be willing to give them a go. It's just too warm and way too orange for my fair skin. The next thing got me very excited. It's the Double Time Brush Buffer + Powder Duo from SPORTFX, no I've never heard of this brand, and upon first impressions it looked and felt quite cheap, but actually it's very soft, I just don't know what I would use it for. Maybe it would be good for powder, or blush. They say it can be used for liquids and powders but I feel it's too flimsy and wouldn't do a huge amount. 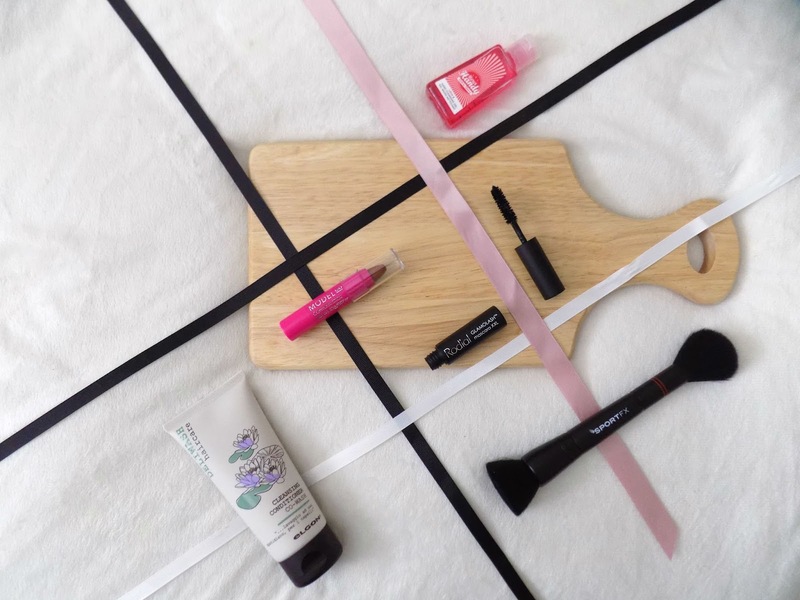 But the bristles are synthetic Taklon which has anti-bacterial properties which is pretty cool. I'll have to try this out and see what works best with. Next is a product I also received in my Look Fantastic Box this month, and that is the MERCI HANDY Love & Hand Cleansing Gel, which is basically an anti-bacterial soap that is great for pre-skincare/makeup application, and for throwing in your handbag and using whilst on the go. I've had one before and I've used it quite a bit. But seeing this exact same scent/flavour Cherie Cherry, I was shocked that two subscription boxes sent out the same product in the same scent, in the same month. Finally is the RODIAL Glamolash Mascara XXL which is a mini, and when I first opened this there was so much excess product on the wand I couldn't even see the shape of it. After scraping off as much as I could, it looks like a standard mascara wand, I just hope that it's not too wet of a formula that it smudges and flakes everywhere. This didn't really appeal to me but I will give it a try and see what it's like. 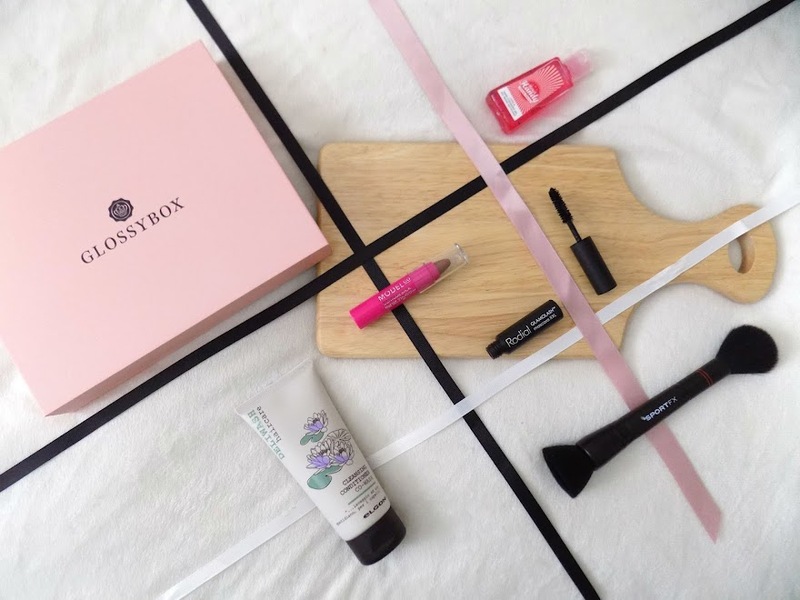 I would have to say my favourite this month is Birchbox, not just because of the actual box but the products I feel I will use most and I think they really made a great box this month. 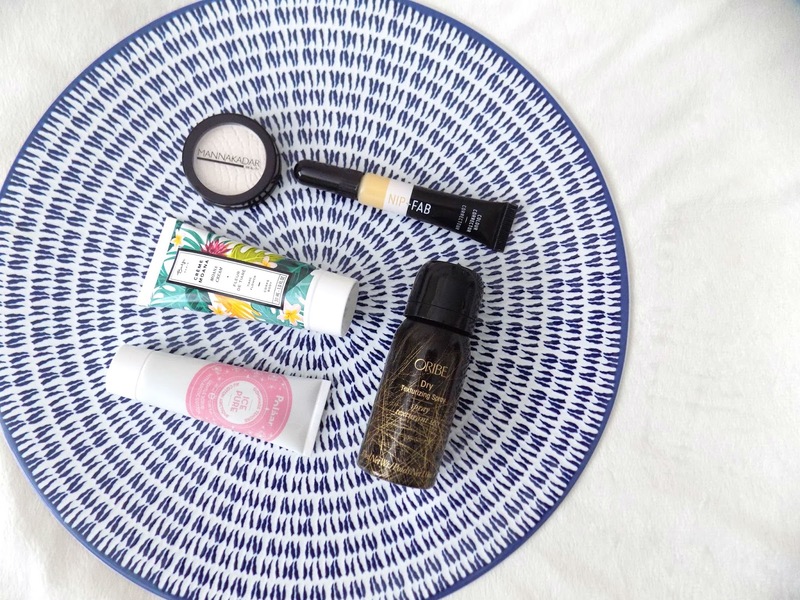 The Oribe Dry Texturizing Spray is what I was most keen to try, but the Manna Kadar Powder is exciting, so is the Nip + Fab Colour Correcting Concealer. 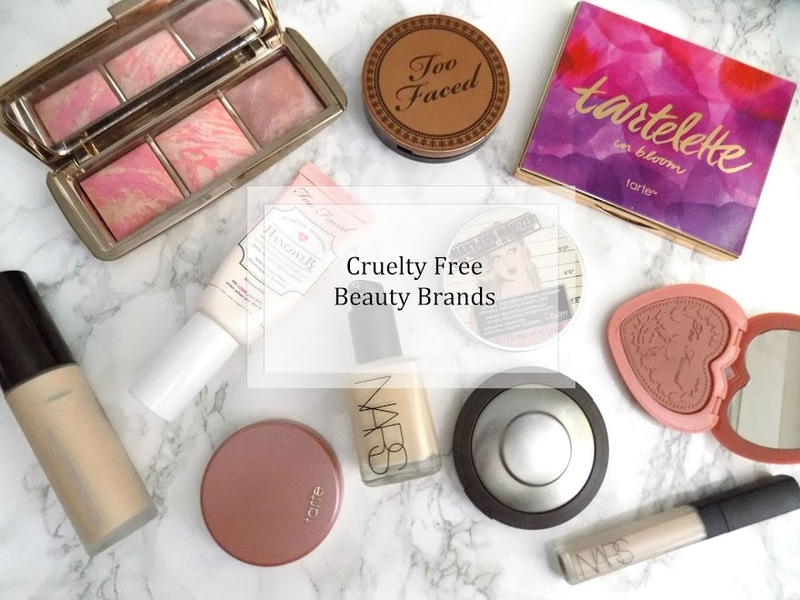 I asked in my Look Fantastic Box post if you would like to see a quick little update as to what I liked and what I didn't like in the previous months box. So if you would like to see this little feature added to this post too, then please let me know so I can do that for next month. Ooh its very hard to decide between the two, they are both lovely and have totally different products inside!